The Ford Transit Connect is a versatile vehicle with the ability to handle a broad range of needs from family adventures to businesses large and small. The Transit Connect Adaptive Van, an ADA-compliant, wheelchair accessible vehicle that is ideal for both private and commercial users, such as assisted living homes, school districts, hotels, and taxi services. The NCV Transit Connect Adaptive Van features an ADA-compliant lowered floor and an innovative new rear-entry fold flat ramp. The vehicle seats up to five adults and one wheelchair user and has the ability to adapt to accommodate multiple combinations of people and cargo. When the vehicle is not being used for the transportation of a wheelchair user, the ramp (with 800 lb capacity) conveniently stores flat, creating a flat floor surface for easy loading of luggage or cargo. Ramp Lays Flat to Adapt to Your Needs! The innovative ramp stows flat, creating a surface for you to store cargo such as groceries or luggage, just like a standard vehicle. The ADA-compliant ramp folds out allowing a passenger in a wheelchair to board the vehicle. Once the wheelchair user is secured, the ramp can be folded up into the vertical position and you’re ready to go! With 30 years of experience in the Mobility Industry, Nor-Cal Vans (NCV) offers Ford commercial shuttles and wheelchair accessible vans with a focus on quality and service. As a certified Ford QVM (Qualified Vehicle Modifier) and Pool Account, our products are designed to meet the rigorous quality and safety standards we strive for in every product. For over 40 years the Ford Transit has been a leader in the European van marketplace. Now made in the United States of America, Nor-Cal Vans offers a Transit conversion for the everyday wheelchair user. Increased fuel economy, maximum interior room, towing capabilities, and double the weight carrying capacity of most modified minivans- the NCV Personal Mobility Transit is an excellent full-size choice. See Transit Dimensions Chart for more details. Seating configurations not to scale. Ford Qualified Vehicle Modifier (QVM) for adaptive mobility vehicles. National Mobility Equipment Dealer Association (NMEDA) member, the Association of Driver Rehabilitation Specialists, the Adaptive Driving Alliance and the Mobility Alliance. Is an approved manufacturer for many State Department of Rehabilitation programs, the Veterans Administration and many Workers Compensation Insurance programs. 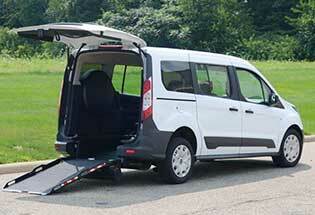 Looking to make your Ford Transit wheelchair accessible? With over 30 years of experience in the mobility industry, Nor-Cal Vans offers several options to make the Transit meet ADA standards. Nor-Cal Vans offers the Curbside Access Transit which features a fixed side-entry wheelchair lift and a stairwell in the front passenger area to allow ambulatory passengers to enter from the curbside.